Most people include the grey and the children, must have ever played poker cards. The adult may play poker games in casino, the children may play common games with friends at home or at some parties. But there is few people know about marked poker cards, which made by invisible ink and special printer. There is also a kind of pen with invisible ink can made marks, but the marks made by pen and by hands is not so professional as made by printer. 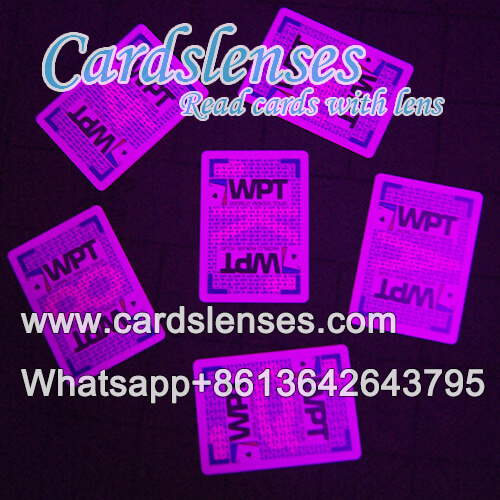 Golden Sunshine is one of the most professional marked cards producer, we can make marked cards of different brand with different patterns, and WPT marked cards of Fournier brand is one of our products. We can mark Fournier WPT blue cards with big font in the middle and red cards with big font in the middle or small font in four corners of the playing cards. And the marks made by our printer and invisible ink can be seen only in the condition when wearing GS-made contact lenses and sunglasses.